We’d love your help. Let us know what’s wrong with this preview of Six Epic Adventure Novels by Lance Morcan. A coming-of-age spy thriller that begins with 23 genetically superior orphans being groomed to become elite spies in Chicago's Pedemont Orphanage and concludes with a political assassination deep in the Amazon jungle. To ask other readers questions about Six Epic Adventure Novels, please sign up. A Brilliant Series. All 3 books are incredibly original and very entertaining. The Ninth Orphan certainly caught my attention with the blurb, and it didn’t disappoint. A very good plot having 23 Orphans being trained as black op’s specialist. The second book ‘The Orphan Factory’ takes us back to when the Orphans were growing up, and ‘Nine’ manages to escape. Then onto the third book ‘Orphan Uprising’ when ‘Nine’ is living on an island with his family, and his world is turned upside down. Lance & James Morcan have put together a wonderful group of characters and a storyline that I have enjoyed so much throughout the three books. They are certainly worth reading. Three incredible books, by two very talented Authors. ‘Into the Americas’ & ‘World Odyssey’ and ‘Fiji’ will take you on the most amazing adventure around the world. The stories have a group of very interesting and diverse characters, and they come up against some harsh and sometimes dangerous conditions. I found myself lost in these stories for many enjoyable hours. Well worth a read. Six Adventure Novels is a fabulous collection of exciting and captivating reads with great plots and storylines, a myriad of colourful and gripping characters and plenty of action and suspense that will keep you entertained and fully engrossed all the way through. The Orphan Trilogy: The Ninth Orphan/ The Orphan factory/ The Orphan Uprising is an International thriller series which follow Nine, the product of a genetic experiment, through his early years and into adulthood as he uses all his amaz Six Adventure Novels is a fabulous collection of exciting and captivating reads with great plots and storylines, a myriad of colourful and gripping characters and plenty of action and suspense that will keep you entertained and fully engrossed all the way through. The Orphan Trilogy: The Ninth Orphan/ The Orphan factory/ The Orphan Uprising is an International thriller series which follow Nine, the product of a genetic experiment, through his early years and into adulthood as he uses all his amazing superior skills and talents to escape The Omega agency, a dangerous and corrupt organisation who will stop at nothing to fulfil their objective of global dominance. The World Duology: World Odyssey and Fiji are epic tales set in the 1800’s which follow the exploits and often dangerous journeys of three very different characters as they journey across continents and eventually arrive at the South Pacific island of Fiji. Into The Americas: is an historical fiction novel and gripping adventure story and introduces us to John Jewitt, a young man whose dreams of adventure and travel become reality as he joins the crew of the brig, The Boston as she sets sail to the Americas to trade with the indigenous tribes who populate the new world. I thoroughly enjoyed them all. I received all the books from the authors for an honest review. This is a box set I can truly recommend to all readers. It has all the elements of a well written book that would keep you busy for long hours to come. The facts and conspiracies within the books are well documented to make this more than just fiction. It leaves you with questions, opening your mind to a different world while reading unique stories with interesting plots. The World Duology is a wonderful Historical series that would I received all the books from the authors for an honest review. The World Duology is a wonderful Historical series that would grab your attention and keep your nose in the books till the very last page. Filled with adventure, drama, romance, betrayal, secrets and many more to make this a must read. The Orphan Trilogy is a must for all conspiracy readers. The characters would draw you into this plot and the easy flowing scene would keep you entertained into the late night hours. The team effort between the two writers are wonderfully constructed and gives you much food to ponder. The writing is superb, the characters believable and the plots unique. 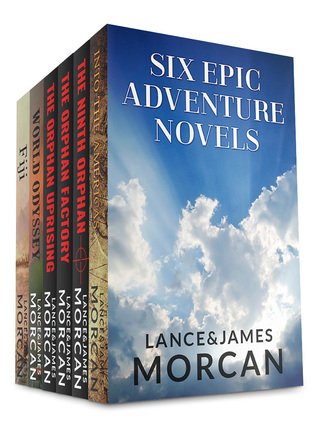 In The Six epic adventure box set you get six adventure novels for one great price. I have read all these books separately and i loved them all. If you enjoy stories with plenty of action and suspense i highly recommend you buy the Six Epic Adventure novels boxed set. NB: This review is a from the publisher.